VelTech University Placements: The main objectives of the placement cell of VelTech University, Chennai is to create promising career opportunities for Vel Tech students in reputed corporate nationally and internationally, to provide the right job for the right person in right place at the right time, to ensure the students start their career and move forward in the right direction for better quality living, to provide ultimate satisfaction to our valuable students by offering the companies of their choice according to their eligibility, to provide career guidance through counselling and one to one interactions with Average and below average students and to enhance the skills of students for Industry ready employer. To better our previous best achievement year on year. 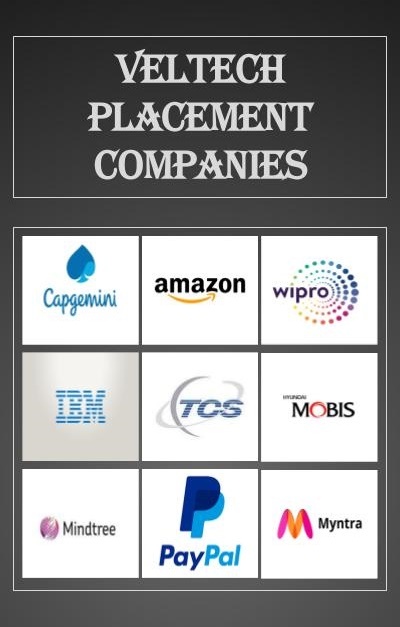 The college shows steady placement records with top companies visiting the campus. Placement in Veltech University is decent, but it depends on the branch that you are opting. I have seen my friends from mechanical, civil, and aeronautical struggling. They had very few opportunities to get placed in core companies. However, I can't deny the fact that the majority of the companies that visited the campus was for use and IT. Though handful companies were good and for core developer role while the majority were tech supports. They had organised job fair once which was hopeless, 99 percent for tech support role. The highest package is 7,00000 and average package is 3,00000. Alumni network is very strong every year the alumn interactions are held to inform the current students about the outside knowledge they acquired. I have done internship at Air India limited, Mumbai in field of maintenance of Boeing 777 and 747. There was no stipend provided for that. I was recruited in Wipro Technologies as project engineer. It is an IT firm. The package given by the company was around Rs 3 lakh per annum which is not satisfactory as per the things told by university at the time of admission. The alumni are connected by social networks but still it is found to be inactive.